GRAFFI GREEN is a liquid graffiti remover for hard surfaces. 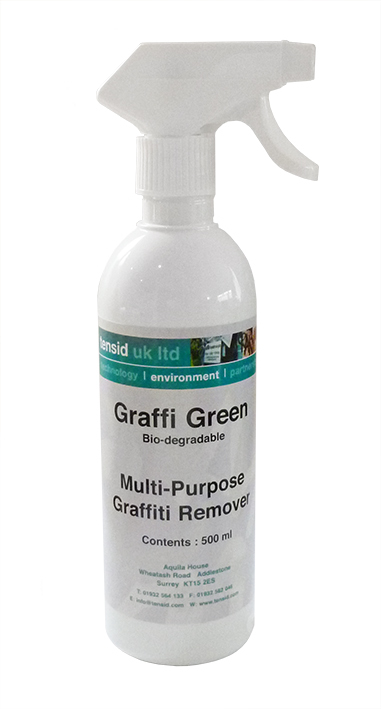 GRAFFI GREEN removes most types of graffiti made with felt pen and spray paint. It is ideal for use on most hard non porous surfaces and can also be used on other non-absorbent surfaces. Safe for use on polycarbonate. Painted Surface – may cause damage to substrate, test first. GRAFFI GREEN is supplied by Tensid UK in the United Kingdom and Europe. Orders placed by 11AM on weekdays will usually be processed the same day and will ship to you overnight.